Longtime kama'aina know that Hilo is much more than a friendly host to the world-renowned Merrie Monarch Festival. It is a town full of history and character. Even today, many Hilo residents can tell stories of how they survived the tsunamis of 1946 and 1960, terrible disasters which killed more than 150 people. Located on the eastern side of the Big Island, Hilo is also the center of many Hawaiian legends and fables. Some are old favorites, while others are more obscure. Here are a trio of intriguing Hilo tales. The first provides a possible origin of how Hilo got its name. Most historians believe Hilo was named after the first night of the new moon or after a Polynesian navigator. According to one account, however, as retold by Frances Reed in her book Hilo Legends (Petroglyph Press, Ltd.), Hilo was named by the great King Kamehameha himself. One day, the story goes, while camped near the mouth of Hilo's Wailuku River, the king desired to visit an old friend who lived nearby. Strong and powerful as he was, Kamehameha never feared venturing out on his own, and he gathered his servants and instructed them to stand guard over his canoe while he was gone. Then the king headed up the river to visit his friend. An hour passed. And then another. And then several more hours. The servants grew uneasy, as their king had not yet returned. Was he ambushed and captured by one of his enemies? Perhaps he had fallen into a steep cavern formed by an ancient lava flow? As still more time passed without any sign of Kamehameha, his men feared for his safety. Still, they dared not leave his canoe unattended. Suddenly, one of the men, who was from Waipi'o, shouted out, "I know what we can do! We can make a rope and tie the canoe so it cannot drift away!" "Make a rope?" the others replied. "How? And with what?" The servant grinned. "Here, I'll show you," he said. Gathering ti leaves, he formed two chains of leaves, and began twisting each leaf. Then he twisted the two chains together, forming a sturdy cord-like rope. "Such twisting," he told them, "is called hilo." After using the rope to secure the canoe, the servants set out to search for their king. They found him a short way up the river, returning to camp, unharmed but more than a little disturbed. "Where is my canoe?" he bellowed. "You promised to stand watch over it! By now it may be drifted out to sea or perhaps stolen!" But the servants explained to him how they had secured the canoe, and Kamehameha nodded his head in approval. "Ti ropes?" he roared. "No one in this area knows how to make ropes like that. Only the people in Waipi'o know how do to that!" "I am from Waipi'o," said the servant who had taught the others to fashion the ropes. "That is well and good," said the king. "From now on, this place shall be called Hilo." It is said that the famous trickster demigod Maui, who lived in Hilo with his mother, the goddess Hina, in a large cave below Rainbow Falls, owned a magic canoe and magic fishhook. With his magic canoe, Maui could cover the distance between the Big Island and the island of Maui with two sweeps of his paddle! And with his magic fishhook, he could catch all the fish in the ocean! One day, while watching a canoe head out on a long, arduous journey to the island of Maui, the demigod wondered if it might not be better to have all the Hawaiian islands joined together. That, he reasoned, would be a tremendous help for all his people. Inspired, Maui called upon Hawai'i's chiefs and strongest men, and told them of his plan to bring all the islands together. "I shall need your help in the pulling," he instructed them, "but no matter how long it takes or how difficult it may be, you must never look back to see our progress until all the islands were completely joined." All the men obeyed and eagerly set out to begin their exciting task. The first island chosen to join Hawai'i was it's nearest neighbor, Maui. Maui the demigod fastened his magic fishhook onto Maui the island, and at his command-"'Oia! Go"-the chiefs and strong men paddled with all their strength. Slowly but surely, the island moved behind them. As Maui had commanded, no one dared look back, although everyone was curious to see the results of their work. It was a struggle, and they paddled long and hard, until the two islands were but a few feet apart! One of the chiefs, however, unable to contain his curiosity, peeked behind him. In an instant, the spell was broken. The island of Maui slid back through the sea to its former position, despite the best efforts of the demigod Maui and his men to pull it back. Only a small piece of Maui remained, the part of which the fishhook was still deeply fastened. This is how Mokuola, once part of the Valley Isle of Maui, happens to be in Hilo Bay. From Vivian Thompson's book, Hawaiian Myths of Earth, Sea and Sky (University of Hawai'i Press), are a few more Hilo-related legends. One is he famous tale of how the demigod Maui captured the Sun. Maui's mother, the beautiful goddess Hina, was renowned for the fine bark cloth, or kapa, she made. All by herself, she gathered bark from mulberry trees, collected sea water in which to soak it and thenpounded the wet bark on her kapa log. One day, while watching his mother pound away on the bark, Maui said, "You spend all your days making kapa!" Hina nodded wearily and smiled at her son. "The day is never long enough,"she told him. "See? My kapa is ready to dry now, but already the Sun is turning toward the west. My kapa will still be damp when the night comes." "This is the Sun's fault!" declared Maui. "He travels too swiftly! I shall find him and make him slow down!" Hina tried to reason with her son, but to no avail. While Maui was a young half-god, the Sun was himself a powerful god with mighty strength. "At least take along your magic club and paddle," she warned him. "You will surely need all the power you have." Before meeting the Sun, Maui made snares, collecting coconut fibers and waving them into eight strong cords. He formed a noose at the end of each cord. He then got into his magic canoe and, with two strokes of his paddle, reached the island where the Sun resided in a crater of a dead volcano. Leaving his canoe, Maui gathered his eight snares and magic club and climbed the steep slope of the House-of-Sun. Reaching the summit, he peeked down and saw the Sun laying in a deep sleep under a blanket of clouds. Silently, Maui laid his snares, then hid behind a lava rock and fell asleep. Maui awoke shortly before daybreak, and he could see the clouds just beginning to drift out of the crater. Then came the Sun's longest leg, the first ray of sunshine, and it unsuspectingly slipped into one of the demigod's snares. Maui drew the cord tight and tied it firmly to a large rock. "What is this!?" said the Sun. Maui was firm and bold. "You are my prisoner," he told the Sun. "Let me go," was the Sun's angry response. "I have a long journey to make!" Maui shook his head. "You will go nowhere until you give me your word that you will travel more slowly." He then explained how his mother needed more daylight to finish her kapa. "Kapa!?" the Sun roared. "Bah! I will not slow down for such things!" Angry, Maui swung his magic club against the Sun's leg, breaking off a piece. The Sun screamed in pain and anger, and out came three more legs over the crater, only to be caught in more of Maui's crafty snares. Four more legs peeked out, and again the four were captured. Maui quickly tied all the legs to nearby rocks. Recognizing his situation, the Sun became afraid. "You would not kill me,"he said. "Without me, your plants and trees would die. And then your people will die!" Maui nodded. "Then let us bargain," he told the Sun. "If you promise to travel more slowly for just part of the time, I will let you go." The Sun had no choice. "'Ae," he said. "I promise." And Maui released the Sun. True to his word, the Sun more slowly for a part of the year, and those days were long and filled with bright sunshine. A delighted Hina was able to dry her kapa. 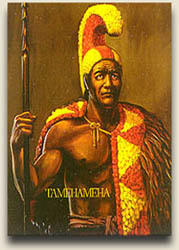 TAMEHAMEHA, BY HERB KAWAINUI KANE Drawings of Kamehameha by European artists were not made until his later years. This painting is an interpretation which attempts to present him twenty five years earlier, as written descriptions suggest he may have appeared in the early 1790's. He knew himself as Tamehameha, before the "T" became "K" in a language change. Considered an upstart by rival ruling chiefs who sought to crush him, he was impelled to seek victory less by the urge for conquest than by the need for personal survival. Later he saw that his people could survive as a nation only if all the islands were consolidated under one government. Other words and images by Herb Kane can be found in his three books which are available through Coffee Times. Click Here.